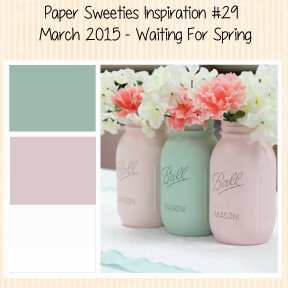 I am kicking off March with a Paper Sweeties Inspiration Challenge. I know I could use some spring! I had little to no luck with natural light trying to get a good photograph. Ready for some sunshine!!! It's another day of Snow and ice here! March is coming in like an Ice Lion! I started this card with a card base of white cardstock onto which I layered some aqua patterned paper found in my scrap box of leftovers. I added the striped paper to the center adding a punched border below it. I stamped and paper pieced the flower and pot adhering to the center of the layered circles. A sentiment greeting was stamped in black ink on a banner which was mounted with foam tape. Finally, a length of white crochet trim was added to the top of the card. Here is the inspiration photo to get you started! So beautiful! LOVING the colors!!!! So pretty! Love the striped panel and the lacy borders! Hi Tammy! So sweet and soft pastelly colors! Love your gorgeous lace trim! Such a sweet card, I love the colors! Tammy, this is SO pretty! Love the touch of lace!! Hope you have an awesome week! Beautiful card, Tammy! Love the polka dot flower in the pot! And, the lace trim is so very pretty! Tammy this is such a sweet card! I think we are all ready for some spring sunshine and flowers!!!! The polka dots and pink stripes make me smile, Tammy -- so pretty!! So soft and sweet Tammy!! I like your delicate lace trim and the soft feel this has. Just beautiful! LOVE the pastel colors, Tammy, and the Sweet lace! FAB flower! Pretty card! Very lovely card, the colors are so pretty! Love the punched border and the touch of crochet trim at the top, such a gorgeous combination! Hope the weather get better for you, we are enjoying mid-60's temperatures in California, not to rub it in. Tammy, love this sweet card. The sentiment and the flowers make me long for spring! This is such a beautiful card, Tammy, and perfect for spring! For some reason, it makes me think of an old-fashioned ice cream parlor--maybe it's the pink stripes and lace. Whatever it is, I love it. Oh Tammy--one of my favorite cards! Stay safe & warm--hoping you get Spring before too long! Really beautiful! I love the little vase of flowers on the layered die cuts, and the fancy borders are gorgeous! Your card is gorgeous Tammy!!!!! Ever so pretty, Tammy! Really loving your lace details and that subtle, embossed background! Tammy, this is beautiful! Noone layers a card quite like you!! !Love it!